Boeing [NYSE: BA] and Jet Airways today celebrated the delivery of the airline's first 737 MAX airplane. 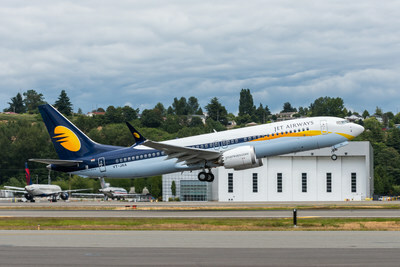 Jet Airways will be first Indian carrier to fly the new and improved 737 airplane, which delivers a double-digit improvement in fuel efficiency and improved passenger comfort. "The new 737 MAX is a critical element to our future growth strategy and we are proud to become the first airline inIndia to introduce this brand new airplane to our customers," said Naresh Goyal, Chairman of Jet Airways. "The 737 has been the backbone of our dynamic fleet for many years and we are excited to leverage the superior capabilities of the new 737 MAX. The improved economics and efficiency as well as the passenger pleasing features of the MAX will enable us to strengthen our position as India's premier airline." "This milestone delivery adds yet another chapter in our long and successful relationship with Jet Airways," saidDinesh Keskar, senior vice president, Asia Pacific and India Sales, Boeing Commercial Airplanes. "Jet Airways continues to demonstrate their leadership in a highly competitive market and I am confident that these new 737 MAX airplanes will enable the airline to successfully achieve long-term growth going forward."